This is a story of Alice Bell, a girl who’s life changed in a span of a moment. Alice grew up in your average home with a bratty sister she adored and parent’s who were a bit eccentric. Maybe not your average family, because Alice’s dad could see monsters no one else could, and that did not sit well anyone. On Alice’s birthday, she talks her parents to venture out at night for her sister’s recital and that’s the night her life changes. Her family gone, and Alice is now seeing the same monsters that plagued her father. Is she going crazy or is this real? When she starts a new school and meets Cole, she’ll have to rethink everything she believes in order to survive. 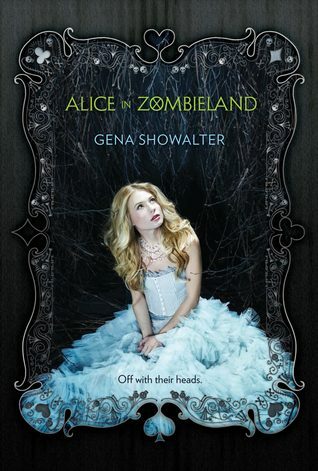 Alice in Zombieland is the first book I’ve read by Gena Showalter and holy hotness why have I waited so long? Seriously, this book was just too much fun to read. Alice is a great character. She has a way about her that every person can relate to, but also something underneath that makes her the perfect heroine. Her emotions are right on the dot and her actions follow the craziness of her life. I loved seeing Alice develop as a character, coming to terms with the world outside of her comfort zone and taking that stand when needed. Enter Cole. Oh Cole, where have you been all my life? This boy, umm, I have no words really. Well, maybe a few. Gorgeous. Dangerous. Fierce. Considerate. Protective. Did I mention gorgeous? He’s really the perfect example of all the best qualities mixed in with all the real ones. I mean, a guy can be perfect on paper, but not so perfect in “real life.” For some reason, I could totally see Cole walking down the street and that’s saying a lot. Together Alice and Cole have to fight a lot more than just their growing feelings for each other. The whole book is action, friendship, and romance blended together for a great delivery. I absolutely adored this book, and laughed more than once at some of the craziness in it. I actually have a soft spot for a lot of the secondary characters which doesn’t happen often. At least not for me. Alice in Zombieland is out now and is the first in the White Rabbit Chronicles. I can’t wait to see what else Gena has in store for us. I’m going to have to go read all of her other books now! Have you read Alice in Zombieland? What did you think? ← Shop Talk Thursday: NaNoWriMo Here I Come!